Provo • The first field goal of BYU freshman Gavin Baxter’s college basketball career was a dunk, but the moment he realized “it was about to get real” came a couple hours before that. The Cougars (1-1) and Baxter return to the court Tuesday night (7 p.m., BYUtv) to face Northwestern State in the second of six straight home games. The Demons of Natchitoches, La., are 1-1, having knocked off Centenary in their opener before falling by just 11 at SMU last Thursday. 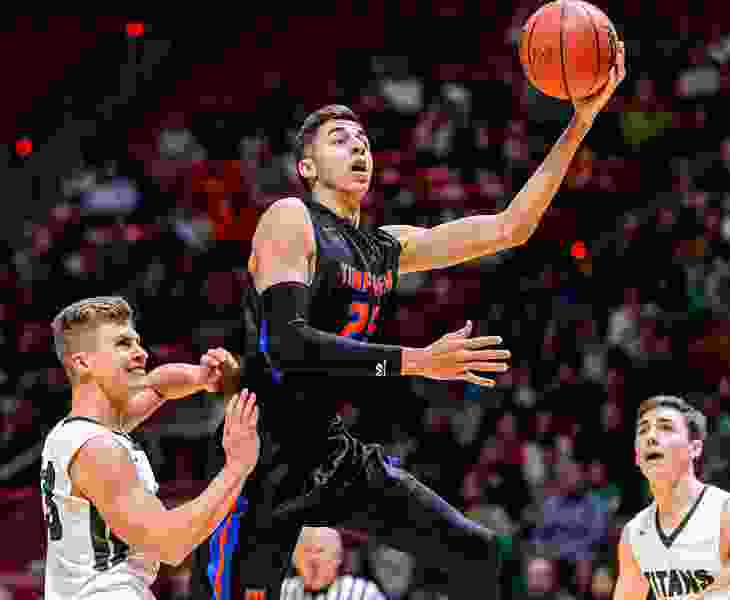 Baxter, a 6-foot-9 returned missionary from nearby Timpview High, finished with four points, four rebounds and a blocked shot in 15 minutes in the 86-70 loss in Reno. In Friday’s 75-65 win over Utah Valley, the freshman played just 11 minutes, but grabbed six rebounds, blocked a shot and scored two points. Coach Dave Rose has been pleased with Baxter’s progress. Against Nevada, Baxter got another welcome to college basketball moment when he was asked to guard the Wolf Pack’s sensational senior forward, Jordan Caroline, a preseason All-America candidate, on a couple Nevada possessions. Caroline finished with 25 points and 16 rebounds. Baxter was a four-star prospect out of Timpview, and called the 63rd best prospect in the class of 2016 by Rivals.com. When he returned last May from his mission to Washington, D.C., he had gained 15-20 pounds and grown an inch. At BYU’s media day last month, Childs called Baxter “an electrifying player” who was going to make Cougar fans forget about his own dunking ability. BYU coaches have measured Baxter’s wingspan at 7-foot-3. Baxter’s mother, Angela, was an All-American sprinter for BYU and his father, Kurt, played basketball for the Cougars. When it came to picking a college, Baxter considered several options, but said in the end he couldn’t turn down the hometown team and the best fit for him and his family. As for his debut, he settled down after some tense opening moments. Tipoff • Tuesday, 7 p.m.
About the Demons • They opened the season with a 102-62 win at home over Division III Centenary and a 69-58 loss at SMU last Thursday. … Senior center Ishmael Lane, a preseason All-Southland Conference selection, had 24 points and 13 rebounds in the loss to the Mustangs. … Coach Mike McConathy is in his 20th year at the helm. … This is the first of four-straight road games. They don’t play at home again until Nov. 23 against Alabama A&M. About the Cougars • Tuesday’s game is the first part of the Men Against Breast Cancer Cougar Cup. The tourney continues Thursday against Oral Roberts. … In Friday’s 75-65 win over Utah Valley, Yoeli Childs had his second-straight double-double — 20 points and 15 rebounds — and TJ Haws 23 points on 8 of 13 shooting. The Cougars assisted on 18 of their 26 field goals.